If you have lived in Louisville long enough, the novelty of the Highlands on a Friday or Saturday night wears of pretty quickly. Traffic is slow, drinks are expensive, and the crowds at each bar are pretty well polarized. 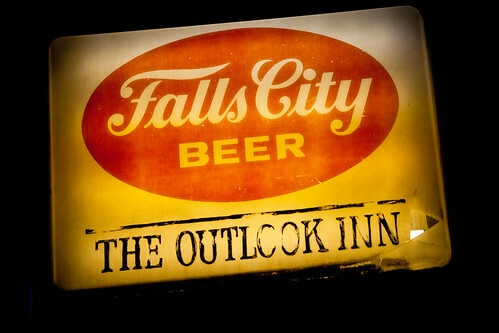 However, there is a standout among the line of Irish pubs on Baxter Avenue: the gem that is Outlook Inn. Situated on the corner of Christy and Baxter Avenues, for the last couple of weeks Outlook has been my home base Thursday night through the small hours of Sunday morning. It’s always my Plan B if other plans don’t pan out, and a great spot to start out the night. Not too trendy, not too hip, Outlook provides a happy medium for those that are looking for a casual, animated space to grab strong drink, talk with friends, maybe shoot some pool, and pick a few songs on the juke box. The best part? No cover. The other best part? The bathroom doesn’t smell like whiskey and vomit. The other other best part? Made-from-scratch Bloody Mary’s…and super strong LITs…and $2 PBRs…and…do you really need another reason?